The Proam Chloride monitor has been supplied for continuous measurement of chloride concentration to industry needing to continuously analyse the final effluent and surface water quality. The Proam ammonia monitor is manufactured in the UK by PPM for continuous measurement of ammonia or chloride in water and waste-water. The Proam ammonia monitor is a compact, simple and reliable analyser suitable for continuously measuring final effluent quality. 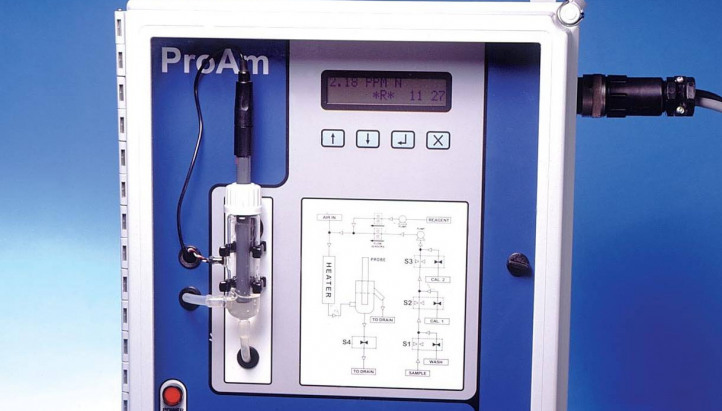 The Proam instrument is simple to operate and maintain. The design can be used for continuous or intermittent analysis and self- validates measurements against know calibration standards. The ion selective measurement technique is ideal for waste-water applications. The dynamic measuring range can be simply adjusted within the range 0 to 35,000 mg/L as N (and to this can be extended by incorporating sample dilution). Whilst the instrument has pinch valve technology and wide bore tubing to minimise the possibility of internal blockage, PPM has also developed sample preparation and delivery systems to compliment the instrument. We are also able to provide to complete engineered monitoring solution including secondary hand rail mounted GRP cabinets and walkin analyser enclosures.